As Harry Potter begins his sixth year at Hogwarts, he discovers an old book marked as "the property of the Half-Blood Prince" and begins to learn more about Lord Voldemort's dark past. Contains series and book spoilers. This movie wasn't a better book adaptation than the previous films but I enjoy it more as a standalone film. There are a few adaptation things that bother me though. -The destruction of the Burrow just seemed pointless to me. The Burrow is completely fine in the next film and there wasn't a plot reason for it other than a pointless Bellatrix scene. I mean, they had access to Harry in that scene but went for vandalism instead. -They left out so many characters (mainly Bill Weasley and Dobby). They were relatively minor to the plot but they are awkwardly brought back in DH pt 1. -Amortentia pretty much just makes Harry drunk. I suppose treating it like an inhibition lowerer makes sense and I can imagine it was difficult to just emote the effects of the potion. 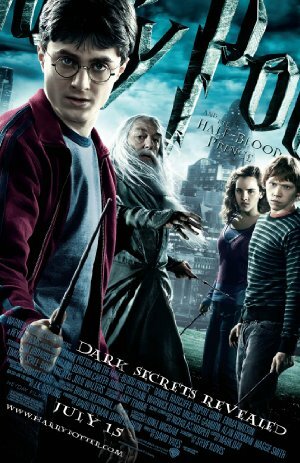 -The identify of the Half Blood Prince wasn't as built up as the books and just kind of happened. It might just have been a thing that didn't translate well into a movie. -It would have been nice to have Merope's story in the movie. She adds such a sad aspect to Voldemort's origins. -We were robbed of getting an Astronomy Tower battle!!!!!!! Instead the Death Eaters just ran through the castle and did some mild vandalism. -Jim Broadbent was excellent as Slughorn. Dumbledore's line about letting him collect Harry came across rather creepy though. -The Ron/Hermione romance in this movie was pretty hilarious. I posted in the book discussion that I don't really get behind them as a ship but I enjoy how Emma Watson and Rupert Grint portray them. -Ron was rather hilarious in this film. Between him and Harry discussing Ginny and Hermione's skin, his interventions at Christmas, Lav-Lav, and recovering from being poisoned. -The Christmas party was one of my favorite scenes -- especially with the dragon balls gaff. This movie has a lot going for it, but it does really well with the few moments of comic relief. Harry's liquid luck scene is one of the best scenes in the whole series. I don't see Radcliffe's read of that as particularly drunk, but more uninhibited and cocksure, because you can see he just feels that he can do no wrong. I guess that's kind of like drunkenness of a certain kind. Hermione: She's only interested in you because she thinks you're the Chosen One. THWAK! goes Hermione's book upside Harry's head. ... and Jim Broadbent is PERFECTLY cast as Slughorn. His delivery of the goldfish bowl story at the end of Harry's lucky night is beautiful and heartbreaking. Gah, that's going to bother me longer than it should. The goldfish story makes me cry half the time. It's such a powerfully done moment. I saw this in a theater farrrr too early on a Saturday morning so the only thing I really remember is Michael Gambon giving away the game with his line reading of "Severus, please." I loved this movie except for one glaring omission. I had been waiting for 5 long movies to see Snape teaching DADA. I was so excited. NOTHING. Not a millisecond. Still mad. That is a glaring omission. It's probably because I've seen the movie more recently than I read the book that I couldn't remember whether Snape was ever shown teaching DADA. It's also a shame we never got to see the Gaunt family and Voldemort's mother, who I always kind of imagined looking like Sadako from The Ring. Hearing the "there's no need to call me sir, professor" exchange would have been up there with the boggart scene in PoA. I always read Harry's Felix Felicis scene as him being hiiiiiiiiiiiiigh as a kiiiiiiiite. This is my favorite HP Film. Just so many great moments. I also love that scene in the library wabbitwax mentions. The way the movies handle Hermione and Ron is frequently not how I would have preferred, but that one moment captures Harry and Hermione's friendship well. Favourite scenes not already mentioned: Harry deciding to go to Slughorn's do with someone cool and that means Luna. Actually all Luna's bits. Ron under the influence; comedy gold. This really is the best of the movies, and I think it succeeds because it's not really trying to be much more than a drama about a bunch of teenagers at school together. That school happens to be a magic one, but the focus stays on the kids and their relationships with each other and it really pays off.